MX boots constructed from innovative, lightweight upper full grain leather with advanced lightweight microfiber and an impact and abrasion resistant shell. Wherever you ride, you'll find stylish, quality motorcycle riding boots to fit your needs at ChapMoto.com. We offer the lowest pricing on a huge selection of top brand name boots for off road and street use. Check out our boot review videos to help you make an informed decision about this vital piece of equipment. Whatever you ride, you'll find the ideal motorcycle boot design with hundreds of professional options in stock. Choose from a durable selection of motorcycle boot types including motocross, adventure, touring, and race boots. Shop for boot types by brand with a collection of favorites including Alpinestars, Fly Racing, Sidi, Fox Racing, and more. 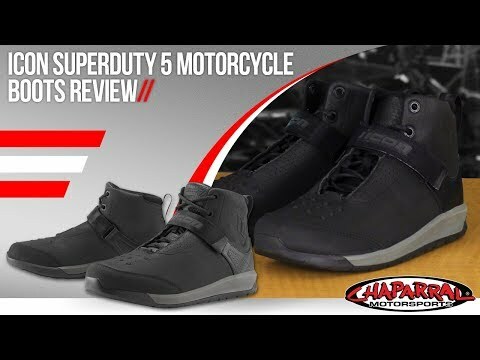 Find the best motorcycle boots available on the market at prices that can't be beat. 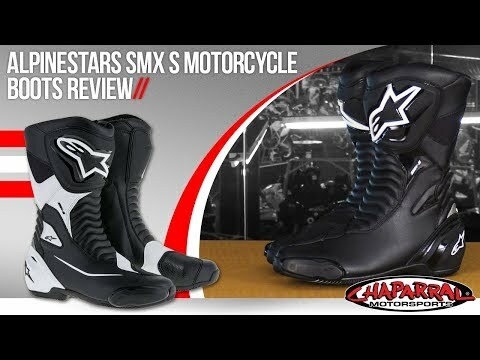 Make both safety and style a priority when you shop for specific types of motorcycle boots at Chaparral Motorsports. Proper protection is one of the most important aspects of riding motorcycles. Protecting your head, arms and legs are the first items to come to mind, but sometimes riders forget the importance of protecting their feet as well. Appropriate motorcycle boots should be worn every time you ride. There are a few things you should consider when choosing a pair of boots, including construction materials and sole grips. Let’s look in more detail at this useful footwear. 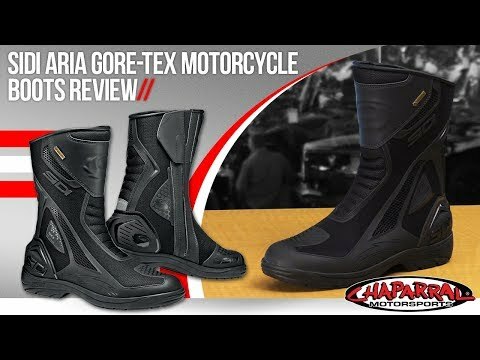 Motocycle Boot Considerations: How do I Choose? In order to pick the right boot for you, there are a few factors you should consider before making a purchase. The following list is not exhaustive. However, it includes some of the most important items to think about when you are choosing your next boot for riding. More important than any other footwear, riding boots should fit properly. If you are buying boots from an online retailer, make sure that you consult the manufacturer’s sizing charts to get the correct size. This is especially important if you need to convert from a European Union (EU) size to a United States (US) size. Boots for racing should be constructed with extra padding and armor. Kevlar, heavy plastic and carbon are common materials used to provide adequate protection. Steel-toed boots offer a hard shield to protect the foot from some causes of injury. Contrary to some opinions, steel toes are a safe choice for most riders. All motorcycle footwear should at least cover up and over the ankle. Since many motorcycle accidents include injury to the ankle and lower leg from pinning or crushing, taller boots are the recommended choice. Tall boots may be less comfortable than short boots but provide considerably more protection. In addition, full-height boots provide better support for the ankle and reduce the risk of sprains and bone breaks. Do you have questions about what type of riding boots you should purchase? Chaparral Motorsports carries a full line of boots for both racers and street riders that are available for men and women. Our order specialists are standing by to help you make the best selection. Give us a call today at 1-800-841-2960 to get the safety protection that your feet need. Protection is key in designing motocross boots, so they are often made from leather that is thicker than your typical street shoes. Manmade materials, plastic sliders and double-leather layers work together to provide the best safety possible as well as protection from the elements. Manmade materials provide the best waterproof options. For leather boots, the boot should be properly treated to be water resistant. A good boot should have double or triple stitching that ensures the boot stays whole even in the event of an accident. Soles that are glued will not last as long or stand up as well if they come in contact with asphalt at any speed. The sole and grip you want will depend some on the type of rider you are. Harder soles offer more durability but less grip and may be better for cruisers and street riders. Softer soles grip better and are often preferred by dirt bike users but will wear quicker than hard soles. Either sole choice should be oil and water resistant. Boot closures range from laces to buckles and straps. Laced options may be quicker to put on and take off, but run the risk of the laces becoming untied while riding or getting snagged when getting on or off the bike. Velcro fasteners are increasing popular in many adventure boot styles and can provide a tighter and more secure fit. Many racing boot options are made with replaceable parts like toe sliders and fitted booties. The ability to replace the parts of the footwear that wear the quickest means that the boots will last longer overall. Booties can and should be removed to be aired out or cleaned, which will extend their life expectancy.